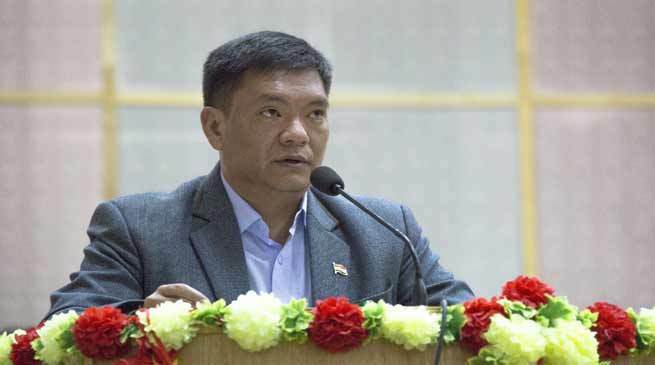 Chief Minister Pema Khandu today said the newly created department of Indigenous Faith and Cultural Affairs (DIFCA) will be a big boost towards cultural preservation efforts by tribal societies in Arunachal. The Chief Minister said the creation of department of Karmik and Aadhyatmik Affairs (DoKAA) initiated during former CM late Dorjee Khandu has helped create many cultural assets including financial support to the monks and students pursuing cultural studies. On the same line, the DIFCA will also help promote indigenous faith and culture with the help from the state government. Addressing the students, monks and youths here at Kalawangpo Hall, the Chief Minister said that preserving one’s own identity and culture should be the prime motive of all, particularly the youths. He hoped that the 2-day seminar, which is jointly organised by Monyul Buddhist Culture Preservation Society and WWF would encourage youths to take keen interest in their indigenous faith and culture. Conveying his best wishes, he encouraged the participants to make best use of the session and the learned resource person. Underscoring the importance of Bodhi language in understanding Buddhist religion, the Chief Minister informed that state government is creating 100 posts of teachers for teaching Bodhi language. He said wherever there are shortages of Bodhi teacher, it will be filled up soon. Padmashree 14th Thegtse Rinpoche who attended as special invitee also spoke on the occasion. Tawang MLA Tsering Tashi also attended the seminar.